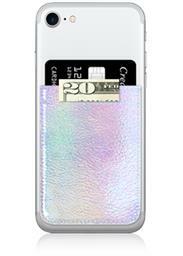 IRIDESCENT FAUX LEATHER PHONE POCKET. (PRICE IS FOR POCKET ONLY PHONE NOT INCLUDED). iDecoz Phone Pockets are peel-and-stick card holders that adhere to the back of all phones and cases. With our Phone Pockets you can carry up to 5 cards and cash on the back of your phone. Use with your favorite Phone Mirror! Peel-and-Stick your Phone Mirror directly onto your Phone Pocket or above it.